This post is Part 7 of a series to augment the Book Reviews by D.N.Frost available for free download. Start with Part 1 here. To earn four stars, a great story must surprise me with something I didn't see coming. Darklands by M.L. 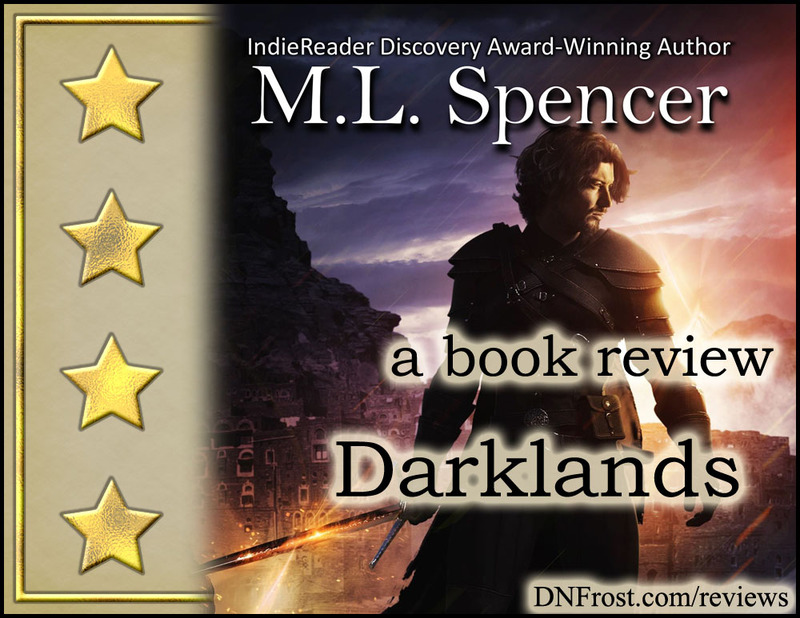 Spencer is Book Three of The Rhenwars Saga, a dark epic fantasy that spans two nations, a millennium of discord, and the realms of several gods. Before reading this book, I read both the first and second books in the saga. I received a free digital Advanced Reading Copy of this novel in exchange for an honest review, and I first connected with M.L. Spencer when I reviewed Book One in Part 1 of this series. Darklands is a thrilling and momentous foray behind the veils of good and evil. M.L. Spencer turns evil inside-out to explore the long-term costs of the desperation and sacrifice in previous books, as well as the consequences of demonizing another people. Deeply fascinating, Spencer's thoughtful and in-depth world-building animates an impossible realm. Clinging to life, a resilient population within a cursed land toils for each square inch of arable light in a black world. They live in darkness, and when their light goes out they will starve. The setup is quick and definitive; it wastes no time delivering the stark conflict in visceral terms. Spencer truly loves her characters, and it shows in how vivid their pain is. They suffer grandly in her loving charge. I enjoyed how some higher technologies like steam power offset the magical deficits of the cursed people, and Spencer's ironic wit shines in the God of Chaos, who struck a covenant to stabilize the world long ago. Darklands is a compelling read, an enthralling premise, and a heart-rending study of the depth and complexity of the human soul. A mere two years after the grand conclusion of Spencer's second book, the ghastly portal to the Netherworld is opened again. But this time, the portal is opened not by a depraved lunatic Hell-bent on power and glory, but rather by a fierce and feral young woman from a cursed land. Sharply called to atone for his wrongs in Book Two, the complex hero Darien Lauchlin becomes a noble anti-hero in Book Three, sworn to help the young woman save her starving people from destruction. In the previous book of the saga, Darien defends his homeland from the Enemy, invaders from the cursed Black Lands beyond the mountains. But in Darklands, Spencer turns evil inside-out and explores the consequences of demonizing another people. Probing both sides of a previously black-and-white conflict between good and evil, she crafts her story deftly, humanizing the Enemy and compelling the reader to resent the "good guys" for their unbending self-righteousness. Unlike the standalone first and second books of The Rhenwars Saga, Darklands reads like a true sequel. This third book picks up the story roughly where the second book left off, and I love how Spencer used Book Three to explore the long-term ramifications of the desperate sacrifices made by characters in the first two books. While Spencer infused a standalone quality into her third book, readers will best appreciate the artful nuances of her complex plot if they read the saga in order. She also keeps raising the stakes. In Book One, a small class of people sought to save themselves. In Book Two, a nation defended against an invasion from cursed lands. Book Three reveals a resilient population within the cursed lands, toiling in utter darkness and sustaining themselves through magic alone. By showcasing this foreign and tenacious people who will starve to death when their magic dies, Spencer adds a beautiful and heartwarming element to a race once known only as the Enemy. The world of Darklands is deeply fascinating, a land vitrified by ancient fire and cloaked in churning darkness. Clinging to life, the people of the Black Lands tend precious crops nurtured by magic light. A short blunt food chain supports short blunt lives, and I love how they developed some higher technologies like steam power to offset the magical deficits necessitated by their agriculture. To my surprise, the people of Darklands enjoyed a few small luxuries like herbs, spices, dyes, and incense that seemed strange considering the value of each square inch of arable light in a black world. I was also surprised at the dark skin tone of their people, considering they bred in darkness for a thousand years, as well as at the vivacious bulk of some of the land's warriors, perhaps glutted on protein compared to the starving population. Spencer's thoughtful and in-depth world-building brought to life an impossible realm, as well as a second land vivid with intrigue and the interplay of various deities. I loved the dynamics of the temple council, and Spencer's ironic wit shines in the God of Chaos, who struck a covenant to stabilize the world long ago. Reaching the end of Darklands, I felt a wash of disappointment when I realized the story needed at least one more book to resolve. Though I knew there was a fourth book, I'd hoped more of the story would fit into Book Three, simply for my own enjoyment. Overall, Darklands by M.L. 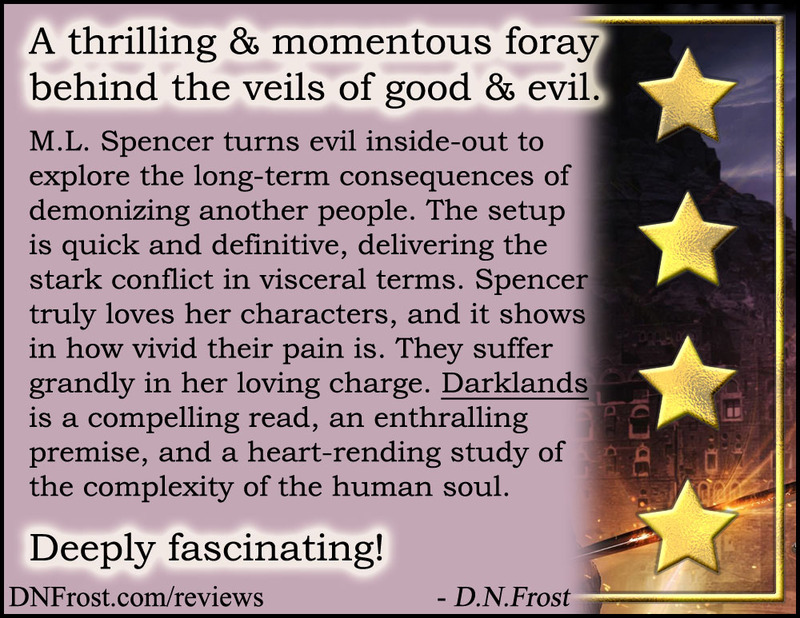 Spencer is a thrilling read and a momentous foray behind the veils of good and evil. I very much look forward to the next book in The Rhenwars Saga. 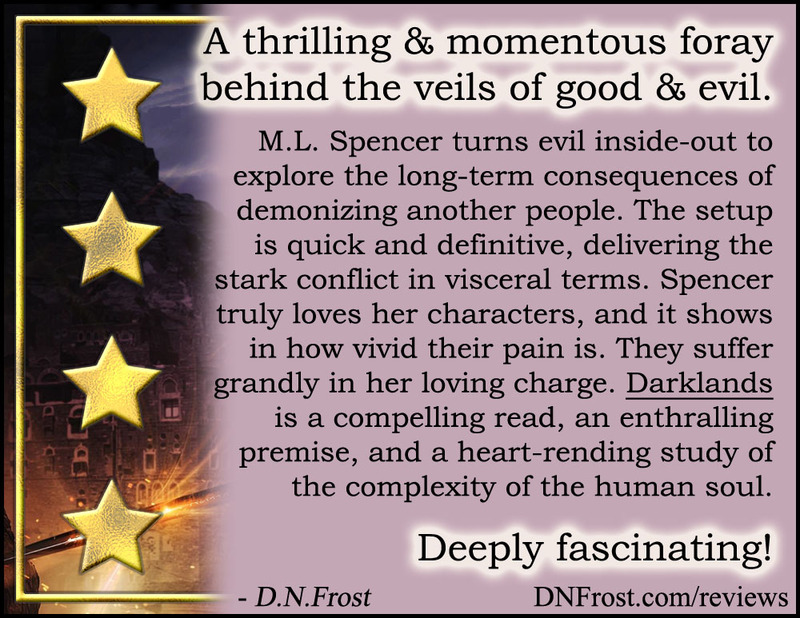 Far prior to this review, Spencer read a book from my own saga and shared this Praise for Awakening with me. After finalizing my review, I shared my feedback with Spencer, and once her book became available for purchase, I posted my honest review for her on Goodreads and Google Books. Darklands by M.L. Spencer here. And be sure to subscribe to M.L. Spencer's newsletter, if you haven't already! That's it for this post! Up Next: The next book in her saga... Coming soon.